A demolition permit has been issued for the single-story Wendy's store at 1101 Walnut St. 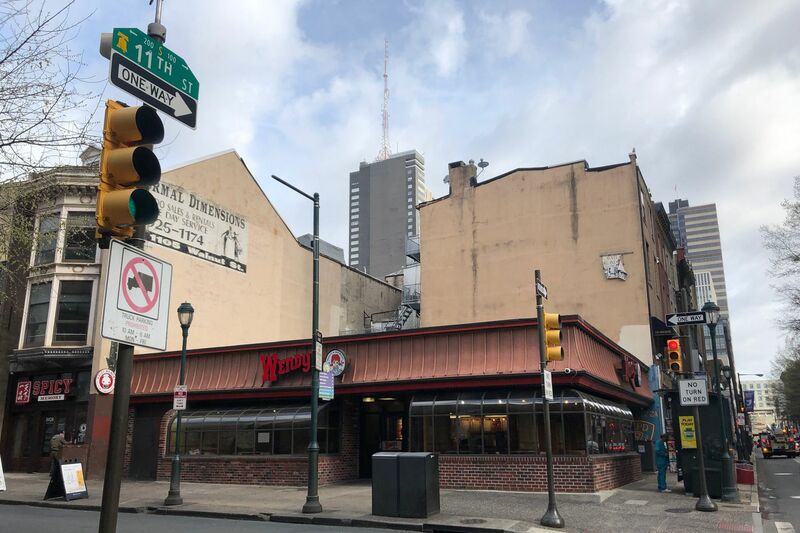 The Wendy’s restaurant at 11th and Walnut Streets, a holdout from an era when a single-story fast-food joint on a prime Center City corner made economic sense, has been sold to a developer and is set to be demolished after being advertised as a possible site for a new high-rise. Peter Abrams, founder of Elkins Park-based Abrams Realty & Development LLC, said Friday that his company bought the squat brick building with a red mansard roof this week from Briad Group of Livingston, N.J.
Abrams, whose company has primarily been a developer of suburban strip malls, declined to share details of his plans for the 3,300-square-foot site and did not specify a purchase price. Brian Wherty, who represented Briad as a principal with Equity Retail Brokers in Plymouth Meeting, marketed the property in an online listing that advertised its commercial-mixed-use zoning. Such a classification that would permit the development of an office or residential tower with ground-floor retail space. The Department of Licenses and Inspections issued a demolition permit for the property on Thursday, city records show. The parcel is on the northern edge of Thomas Jefferson University’s dense urban medical campus, and just south of the blocks where hundreds of new apartments, Target Corp. and TJ Maxx stores, and eateries including Iron Hill Brewery & Restaurant have recently risen. Larry Steinberg, a Philadelphia-based retail property broker with no involvement in the site, said he doubted that Briad was selling the restaurant because sales were lagging. “I think they want to cash in on the real estate," he said. Messages left with Briad founder Bradford Honigfeld and Wendy’s Co.'s corporate offices in Dublin, Ohio, were not returned. It was not clear when the 1101 Walnut restaurant was built. The Inquirer characterized it as “dominating” the intersection’s northwest corner (“A strong position, as Von Clausewitz would say") in a 1982 story about an ad for a nearby McDonald’s posted on a neighboring wall. Fifteen years later, an ownership group led by the late businessman Elliot E. Arking, who would go on to cofound online store Wines 'Til Sold Out, sold the franchise to a Wendy’s corporate entity, according to records filed with the city. That entity sold the property to a Briad affiliate in 1998. In January, Wendy’s dropped a deed restriction on the property’s use, which would allow it to be redeveloped, property records show. The existing building is characteristic of development during the 1970s and 1980s, when Center City’s commercial and residential vitality was being sapped by the era’s long economic slump, said Howard Haas, a Philadelphia aficionado of movie houses, bank lobbies, and other everyday architecture. With little demand for central Philadelphia real estate at the time, vacant upper floors of buildings were being lopped off — as with the former N. Snellenburg & Co. department store at 11th and Market Street — amid weak demand for space, and huge swaths of land were being given over to parking, Haas said. Now, “there’s no area of Center City that isn’t valuable for upscale development,” he said. Catherine Timko, chief executive at the Riddle Co., a retail consultancy that advises the Center City District, said the probable departure of Wendy’s from the corner is also a sign of Center City’s shifting customer base.